Sometimes I worry that I might be a bit of a geek when it comes to things like this. Then I get over myself. It all happens quite quickly, so you needn’t worry. 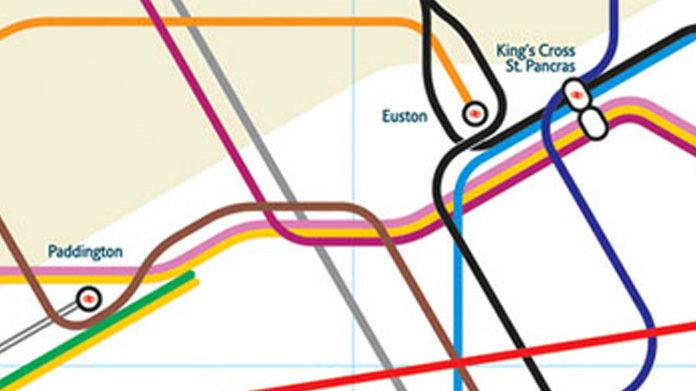 Anyhoo … designer Mark Noad has been playing around with London’s Tube Map. Now that’s a dangerous old business, what with Beck’s design being generally recognised as one of the great design pieces of all time. However, Mark has nevertheless had a crack at it, arranging stations a little more accurately according to their position in the real world and adding the journey times between them. It’s actually a rather smart innovation and well worth a look. However, the thing that really caught my attention was the fact that he has also created an overlay that shows which stations have step- and escalator-free access. It’s pretty terrifying, particularly as Mark has simply removed the stations from the map that don’t have this feature. God help you if you’re a tube-user in a wheelchair, is all I will say. I knew it was bad. I didn’t realise it was this bad. The funny things that smart design point up though, eh?